Single-phase induction watthour meters (or energy meters) are extensively used for the measurement of electrical energy in a.c. circuits. One can find such meters installed in homes. An induction watthour meter is essentially an induction wattmeter with control spring and pointer removed but brake magnet and counting mechanism provided. Construction. Fig. 16.77 shows the various parts of a single-phase induction watthour meter. It consists of (a) two a.c. electromagnets ; the series magnet and shunt magnet (b) an aluminium disc or rotor placed between the two electromagnets (c) brake magnet and (d) counting mechanism. The shunt magnet is wound with a fine wire of many turns and is connected across the supply so that it carries current proportional to the supply voltage. Since the coil of shunt magnet is highly *inductive, the current (and hence the flux) in it lags the supply voltage by 90°. The series magnet is wound with a heavy wire of few turns and is connected in series with the load so that it carries the load current. The coil of this magnet is highly non-inductive so that angle of lag or lead is determined wholly by the load. 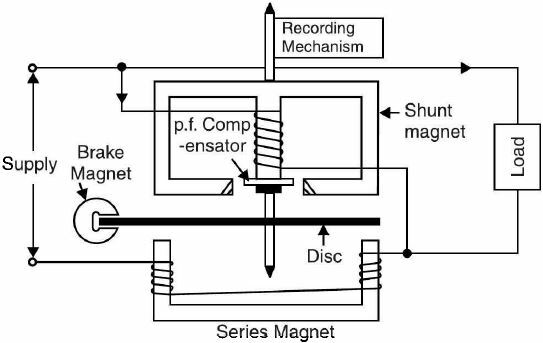 A thin aluminium disc mounted on the spindle is placed between the shunt and series magnets so that it cuts the fluxes of both the magnets. The braking torque is obtained by placing a permanent magnet near the rotating disc so that the disc rotates in the field established by the permanent magnet. 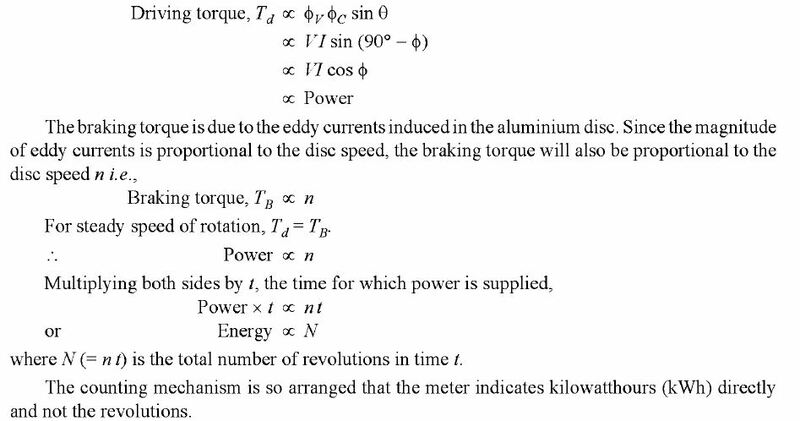 Eddy currents induced in disc produce a braking or retarding torque that is proportional to the disc speed. A short-circuited copper loop (also known as power factor compensator) is provided on the central limb of the shunt magnet. By adjusting the position of this loop, the shunt magnet flux can be made to lag behind the supply voltage exactly by 90°. Frictional compensation is obtained by means of two adjustable short-circuited loops placed in the leakage gaps of the shunt magnet. Geared to the rotating element is counting mechanism which indicates the energy consumed directly in kilowatthours (kWh). Hence the number of revolutions made by the disc for 1 kWh of energy consumption is called meter constant. The meter constant is always written on the name plates of the energy meters installed in homes, commercial and industrial establishments. If the meter constant of an energy meter is 1500 rev./kWh, it means that for consumption of 1 kWh, the disc will make 1500 revolutions.